In a bombed-out former post office, pockmarked with bullet holes and shrapnel, a group of uniformed Tamils plotted their ambush. Most of them were hidden behind a thicket of bushes on the main road through rebel-controlled territory, just 10 minutes outside Kilinochchi, the Tamil Tigers' unofficial capital. One of them had blown his cover by venturing out onto the roadside, bearing a warlike insignia on his sleeve - a sharp-fanged Tiger, roaring ferociously. The men spoke conspiratorially into their walkie-talkies. The man by the roadside had his finger on the trigger. Yet the men were dressed not in combat fatigues but blue pleated slacks and sky blue shirts. And they were wielding nothing more threatening than a radar gun. The only thing they were interested in killing was the speed of errant drivers. Within minutes, the traffic cops had claimed their first victim, a motorcyclist hurtling down the road on a Honda Hero. The digital display on the radar gun showed him travelling at 51 km/h on a section of road with a 40 km/h speed limit. 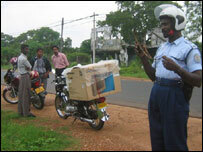 The motorcyclist was given a stern talking to and handed an on-the-spot fine of 600 rupees (6 dollars). Suitably chastened, he mounted his bike and headed - more cautiously - towards town. 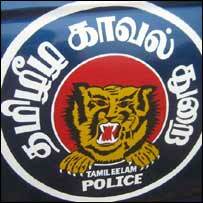 Serial traffic offenders might end up under arrest, and be carted off to jail in one of the force's smart blue Toyota Land Cruisers - impressive-looking vehicles with the word POLICE emblazoned in pristine white letters on the bonnet, and the Tamil Tiger insignia on the doors. Perhaps they might even end up on trial at the local court house, where the proceedings begin each morning with a salute to the Tamil flag. The Liberation Tigers of Tamil Eelam - to give the Tamil Tigers their full name - control about 15% of Sri Lankan territory. But the traffic cops and the courthouse are mere fragments of their longed-for state, and far from the fully-independent ethnic homeland that the Tamil Tigers have fought for since 1983. Kilinochchi is remarkable for three things: the war-damaged buildings that line its streets; the martial statues which venerate its war dead (one of the biggest is the statue of the first female suicide bomber); and the immense scale of its main cemetery. 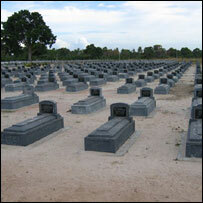 The cemetery contains row upon carefully regimented row of graves and tombstones - almost 2,000 in all. Most are shaped like coffins, with polished black marble nameplates. But there are hundreds of simple tombstones commemorating the 'Black Tigers' - suicide bombers whose bodies were blown to pieces. This for the Tamil Tigers is hallowed ground. Only the lives of those they call martyrs for the cause are commemorated within its walls. In the cemetery we met 24 year old Suganthini and 25 year old Iyali, two members of the Tamil Tigers who had arrived at the graveyard bearing dark pink rose petals. They had come to dress the grave of their former comrade, Senthamilini, who had been killed during face-to-face conflict with the Sri Lankan army in Jaffna, the largest city in the north. As they stood at the graveside, the two young women thought of their friend's sacrifice, and the reasons why they are prepared to carry on the fight. "The Sri Lanka Army killed my father in front of my eyes, and then raped my sister," said Iyali, who was first inducted into the Tigers at the age of 16. "If my leader tells me to fight, I am prepared to die for the Tamil homeland." The sentence was at once dignified and hate-filled - the most chilling distillation of the Tamil cause that I have ever heard. Despite dropping its demand for outright independence ahead of a truce agreement in February, 2002, the Tamil Tigers want to extend their writ much farther than their present fiefdom. Their aim is to control a vast, spear-tip-shaped area of land encompassing all of the disputed north and much of the western and eastern seaboards. This so far thwarted ambition is one of the reasons why the peace process is presently stalled, and the political violence continues almost daily. The Tigers are not yet ready to sue for a permanent peace because they still believe they can achieve a more satisfactory power-sharing deal. They knew that boycotting the presidential election would depress the vote of Ranil Wickramasinghe, the former prime minister who negotiated the 2002 ceasefire agreement. The Tigers are not yet willing to return to the negotiating table, and they would have been under great international and moral pressure to do so had Mr Wickramasinghe triumphed. The Tigers wanted a hawk to win rather a dove. This presidential election had asked of the Sri Lankan people the same question which has been posed since the country's independence in 1948. Can the country's Sinhalese majority and Tamil minority occupy this stunningly beautiful island in peaceful coexistence? For now at least, the answer from the Tamil Tigers would appear to be no. They had dubbed Mahinda Rajapakse the "war candidate" - and their boycott helped him win.